At a young age, Zach Morrow knew he wanted to serve others. He found joy in serving. Afterall, he grew up a missionary kid so the idea of serving others was somewhat home-grown. Like a lot of young boys, Zach ventured into mowing lawns in the summer. He started in seventh grade mowing a neighbor’s yard, and during the next six years that neighbor’s yard grew into a bonafide lawn-care business with more than 40 yards. The “sweaty work” that his dad encouraged him to do paid off as Zach gained the invaluable know-how of a hard, work ethic. Thus an entrepreneur was in the making. Zach was kind of like the Hulk, an untouchable hero type. But if you remember, the Hulk had a dark side. He was literally powered by rage. During this time of accolades and success, Zach’s mindset shifted from ”sweaty work” and serving others to one with a focus on success and making money. His goal was to make money – the most money – he could in life. A few months before Zach’s final semester at Baylor, he befriended two students from the University of Pennsylvania. The three had a mutual passion to promote human flourishing through business. But what exactly would that look like? They explored the idea of a microfinance business model to support entrepreneurship in developing countries, but very quickly realized that was too difficult for college students to successfully launch. Then the trio shifted gears to the idea of using round-up technology to help non-profit organizations in fundraising efforts. The idea was well received by the non-profits, but it became clear that the needs were pressing and immediate. The collegiate trio realized that this idea needed to materialize sooner rather than later. Not wasting any time, Braden Fineberg, of the University of Pennsylvania side of the partnership, built a simple platform and app over the course of one weekend. With due-diligence they tested the app and it worked. And Flourish began, turning pocket change into global change. Flourish offers a micro-donation and donor analytics platform where non-profit organizations collect electronic pocket change from debit and/or credit card transactions of donors. For example, a $3.50 latte at the local coffee house will be rounded to $4.00. Flourish collects the $.50 round-up change. The donor selects how to allocate the monies and the non-profit of choice receives the pocket change. Zach experienced his share of growing pains while getting to the point of Flourish, but he came out more resilient and determined than ever. And the professors at the business school noticed. 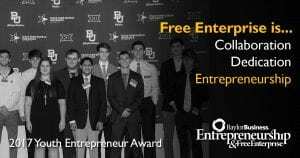 During Zach’s final semester at Baylor, he was recognized as the Outstanding Student in Entrepreneurship at the Baylor Hankamer School of Business Senior Appreciation Banquet. Zach certainly still has a superhero quality, but maybe not so much on the dark and Hulkish spectrum. Perhaps there’s more of a Captain America-esque aura about him, but with a sic ‘em bears kind of flare. For more information about the John F. Baugh Center for Entrepreneurship & Free Enterprise, please visit our website at baylor.edu/business/entrepreneur/. If we’re honest – really honest – we would admit that there is a little bit of Cookie Monster in all of us. And let’s be real, there have been times when, like the Cookie Monster, all we can muster are three simple words… me want cookie! But what if you could squelch that cookie craving with a Texas Two-Pound Chocolate Chip Cookie that’s the size of your face? Whether you have a hankering for a colossal two-pounder or a craving for a more unassuming dozen, Madi Smyser of Madi’s Munchies can take care of your inner Cookie Monster. Madi’s Munchies is a fabulous little cookie haven in Austin, Texas, that provides a respite for those struggling with an uncontrollable cookie craving. But what makes Madi’s Munchies different from any other bakery, aside from the obvious two-pounder? Madi, the founder and CEO of Madi’s Munchies is a 17-year-old who just completed her junior year at Vandegrift High School just outside of Austin. You read that right. The mastermind behind Madi’s Munchies and the gargantuan two-pound cookie is a high school student. And it all started with a case of the munchies – Madi’s munchies. During the fall of 2016, Madi hopped into the kitchen to whip up a batch of homemade granola bars to pack in her lunch. With a little bit of this and a little bit of that, the end result was a mighty tasty bar. Madi wasn’t the only one whose taste buds did flips for the bars. Others liked them too. In early 2017, as any budding entrepreneur would do, Madi started selling the bars in her neighborhood. But what do people like even more than made-from-scratch granola bars? Cookies. Folks really, really like homemade cookies…fresh-from-the-oven homemade cookies, to be more specific. Madi was on her way to being a bonafide cookie-baking aficionado. She knew what her customers liked and she had a solid customer base. But could she do more? That was the $100,000 question. In August 2017, Madi accompanied her dad to the Success Summit real estate conference where renowned real estate coach and speaker Tom Ferry was the keynote speaker. During a Q&A session with Ferry, Madi asked some general business questions concerning her cookie-baking business. Ferry provided some insightful thoughts, but also offered up a challenge. If Madi can sell $100,000 of cookies and other baked goods by the 2018 Summit gathering and keep up her grades in the process, Ferry said he would give Madi $5,000. He would give her $1,000 at the $50,000 sales mark and the remaining $4,000 when she hit $100,000. And it just so happened, someone from Tom Ferry’s inner circle had a close connection to a producer for the the Rachael Ray Show. Madi took Ferry’s advice to heart and sent a package of cookies to New York for the producers to try. On November 9 a head producer of the Rachael Ray Show contacted Madi. She provided footage of actually whipping up a batch of Madi’s Munchies cookies and the segment ultimately aired on the Rachael Ray Show on December 4. The accolades continued. A couple months after her debut on the Rachael Ray Show, Madi received second place recognition in the third annual Baylor Youth Entrepreneur Awards. 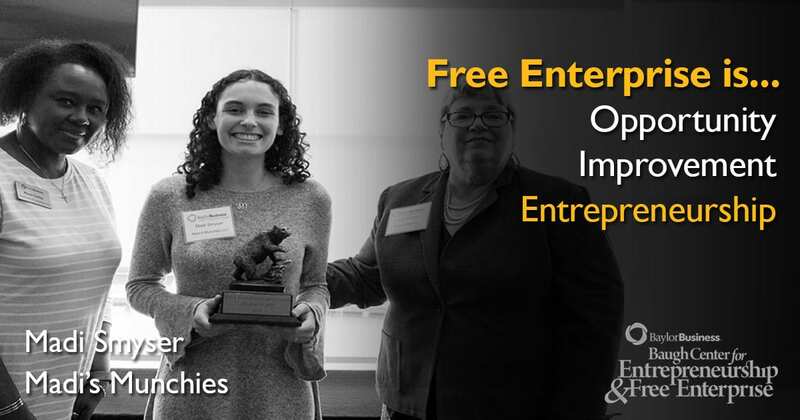 Through this program, Baylor’s Baugh Center for Entrepreneurship and Free Enterprise recognizes young entrepreneurs from across the country and provides these students with an opportunity to network and explore options as they pursue their entrepreneurial dreams. 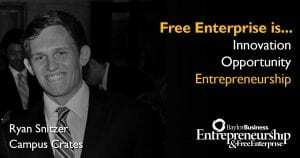 Growing a successful business so quickly certainly came with an array of challenges. In order for Madi to have the type of business she wanted, access to a commercial kitchen was imperative. She tried out a couple of different kitchens, each with different issues and idiosyncrasies before she finally settled on the one she is currently using. She had to decide what exactly she needed in a kitchen before she could choose the right one. The next hurdle was finding the time and money for all of the certifications, permits and licenses required to sell baked goods on a larger scale. Prior to the agreement with Ferry, Madi operated business under the Texas Cottage Food Industry Laws, which allowed for baking to be done in a house. Madi could also sell directly to customers with only a Food Handler’s certification. Madi’s Munchies outgrew that, and Madi had to obtain a Food Manager license accompanied by other permits and routine inspections. But the challenge with Ferry had two conditions. The first condition was $100,000 in sales and the second was to maintain good grades. Madi admits it has been hard at times to juggle her growing business along with school work. Afterall, junior year is certainly no walk in the park. Time management is something she is learning and mastering. Madi’s objective is to make the most of every single minute of each day. Madi loves what she’s doing and her customers love her cookies. It’s a win-win that even the hangriest Cookie Monster would have to agree! Three words that can conjure up just about every conceivable emotion within a mere minute. Excitement – It’s a new home and a new adventure. Nervousness – The unknown is, well, unknown. Anxiety – There’s just so much to do. Dread – Packing and unpacking are about as enjoyable as a root canal. Rest assured, there are loads of online resources with tips and suggestions to make packing and unpacking less of a pull-out-your-hair-in-a-frenzy experience and more of a…more of a… Oh, let’s face it, you’re never going to have a lollipop and rainbow day while packing and/or unpacking, but there are tips to definitely make it a little easier. TIP 1: Before you box up electronics, grab your phone and take a quick picture of how everything is hooked up and connected — BEFORE you disconnect. TIP 2: Designate a different colored duct tape for each room and use the colored duct tape as a way to tape boxes shut but also as a way to label the boxes. TIP 3: Pack the essentials that you will need right away in a clear plastic tub. And the most important tip if you’re a Baylor student is TIP 4: Contact Campus Crates! Never heard of Campus Crates? It just happens to be an incredibly innovative and ingenious business launched by a couple of Baylor students to help ease the moving frustrations that parents and students experience, especially with a May end-of-lease move. 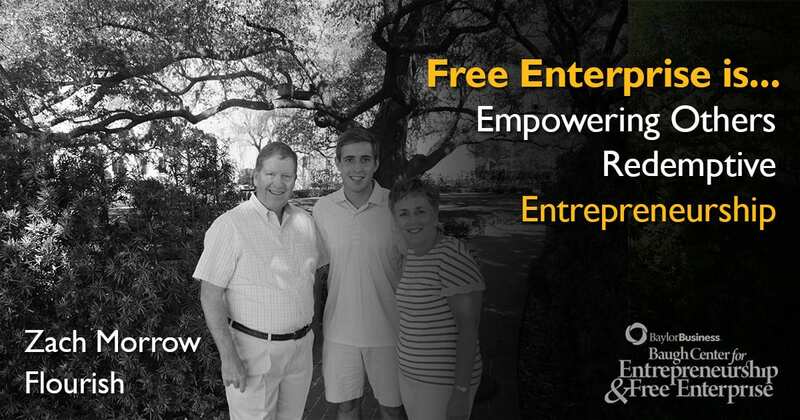 Ryan Snitzer created the business with his previous partner, Ryan Robinson, during their sophomore year at Baylor. The idea of Campus Crates came about as they discovered the need for summer storage after having previous troubling move-out experiences at the end of their Freshman year. It was in that moment the two realized that there had to be a convenient, yet affordable, alternative for Baylor students. And as any Entrepreneurship major would do, they put the “had-to-be” thought to work. The budding entrepreneurs utilized a stockpile of amazing resources within the Baylor Business School to make the “had-to-be” thought become a reality, and they relied on the guidance and advice of Mary Abrahams and David Reid. Snitzter also fell back on the example and leadership of his entrepreneurial father. The initial goal was to conquer the world of storage and moving – to be the McDonald’s of the storage and moving industry. Admittedly, it was a lofty dream, but over time they realized that a leaner and more narrow approach would help produce an initial success. It was also understood that a rigid business plan would not work with the harried schedules of fellow students. Going into this venture with adaptable and open mind was a necessity, and ultimately the key to Campus Crate’s success. Customers register with Campus Crates and pay. Campus Crates schedules a time. Campus Crates delivers boxes to customer’s front door. Customer packs boxes at their convenience (see tips 1-3 to make it easier). Campus Crates stores belongings in a secure facility during the summer. Campus Crates returns belongings to customer in the fall. Campus Crates has moved out and stored over 200 students belongings in less than two years. That means Campus Crates has saved 200 students from the pull-out-your-hair-in-a-frenzy packing and/or unpacking experience and maybe, just maybe, also helped those students have a lollipop and rainbow day. Students all over campus are mighty glad that “had-to-be” thought of an easy, convenient and flexible moving experience became an actual reality with Campus Crates. Snitzer recently merged the business with The UPS Store in Waco and plans for the business to continue to assist students in moving, shipping, and storing their belongings for years to come. What comes to mind when you hear the term good ol’ days? For a lot of folks, the good ol’ days are the years spent in high school. Football games, homecoming dances, proms and first glances from a high school sweetheart – a lot of good memories, albeit some very awkward memories, but nonetheless good memories indeed. Adulting can be hard and it can be stressful. And let’s face it, with grown-up jobs, bills and decision making the fun and lackadaisical good ol’ days feeling can be somewhat elusive at times. 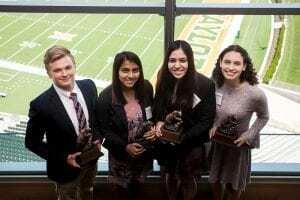 But there is an elite group of students who brilliantly combined the good ol’ days of high school with the responsibility of adulting with such amazing finesse that Baylor just had to honor them with 2017 Youth Entrepreneur of the Year Awards. Yes, you read that right. Youth and entrepreneurship in harmony, sort of communal like two peas in a pod. But really, those two words go together like fine mess, jumbo shrimp, clearly confused, old news and awfully good. Youth aren’t supposed to be entrepreneurs. That’s adulting stuff. Youth should be living it up in the good ol’ days. Maybe so, but these students have blazed an entrepreneurial trail like none other. 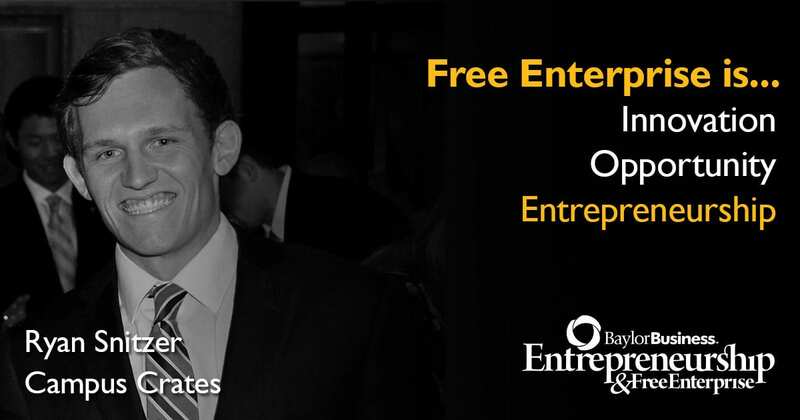 And we’re not talking cookie-cutter entrepreneurial endeavors either. These youth entrepreneurs were successful with pizazzy socks and chic personalized gifts. Definitely not run-of-the-mill side gigs. 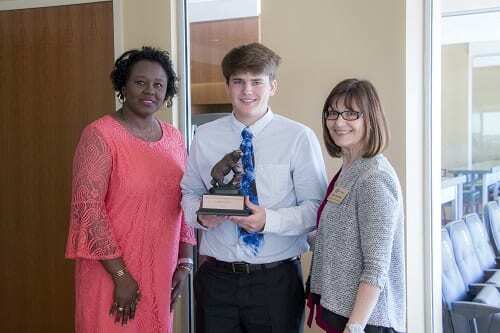 The first place recipient of the 2017 Youth Entrepreneur Award was high school junior, Brennan Agranoff. Brennan is the founder of HoopSwagg, an apparel customization business that specializes in socks. These aren’t ordinary, boring socks though. These are pizazzy socks. Be warned. If you’re looking for plain-jane, blend-in-with-the-crowd kind of socks, steer clear of HoopSwagg. But if you’re looking for socks with an edge, sock that make a statement with design names like Psycho Rainbow, Goat Farm, Detonation and Eyeballz then you must check out HoopSwagg.com…now. But how in the world did this happen? It all started in seventh grade. In midst of typical adolescent self discovery, Brennan became obsessed with socks. The only problem with that was everyone was wearing plain colored socks. And plain colored socks didn’t satisfy this budding sock aficionado. Brennan mowed the lawn all summer and saved his money to buy the very coolest pair of wildly-colored socks online for $50. He wore the perfectly hued socks to school in the fall and all of his friends were duly impressed. As with any entrepreneur, Brennan wondered how he could make a razzle-dazzle sock on his own. For six months he researched processes, equipment and production. He then had a few samples made and tried his luck on eBay. Not knowing exactly what to expect with his first try at eCommerce, Brennan was thrilled when the socks instantly sold out. Brennan knew he was onto something with his flashy feet accessories. He prepared a business plan and asked his parents for a $3,000 loan. The parentals loved the idea and complied with the loan request. By August 2013, armed with funding, equipment and a live website, HoopSwagg, LLC was the real deal. There have been a few bumps in the road for Brennan. One of the biggest hurdles has simply been his age. Paperwork, financials and trademark submissions all required a parent’s signature. And then there’s the unknown. The not knowing what can go wrong is a struggle. But Brennan looks at each new problem as an opportunity to find a solution. A lot has changed since that initial 2013 launch. HoopSwagg now has its own brand of sock and Brennan is looking to expand his high school basketball program to more than 500 teams. Eventually, he would like to introduce the retail market to his less expensive, high quality socks. 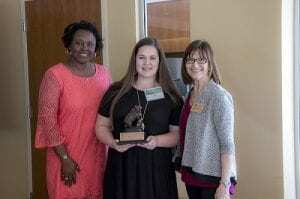 The third place recipient of the 2017 Youth Entrepreneur Award was high school sophomore, Addison Bain. Addison is the founder of Addigrams, a business that takes everyday items like travel mugs and backpacks and personalizes them with monograms and names. A morning cup of joe in a chic, personalized mug…yes, please. The budding entrepreneur took the “and more” and ran with it. Immediately she imagined all of the ways she could use a Cricut, and like any innovative teenager would do…she asked mom and dad if they would buy her a Cricut. The conversation didn’t go quite as Addison had hoped, but that didn’t stop this precocious teen. Addison started saving her babysitting earnings. By September, she had $190. Even though she was still $60 short, Addison’s parents chipped in the remainder and bought the Cricut. After a few weeks of experimenting with the Cricut, Addison’s wheels were turning. She started thinking of all the different customized items she could create with the Cricut. All of the things she could create…and sell. Addison wanted to start her own business. With backing from mom and dad, Addison created an Etsy shop. Initially, customers were family and friends. However, that soon changed with the magical powers of social media and word-of-mouth praise. And like any successful entrepreneur would do, Addison wondered how she could make her business better. Embroidery was the next plan of action. Addigrams’ custom-chic, monogrammed and embroidered items have been shipped to 22 states. Addison does close the Etsy store during school months, but during that time she takes every opportunity to participate in community events and markets. Her next plan is to broaden the product line to include leather jewelry. Maybe Brennan and Addison are onto something. Something big. Something extraordinary. Something that dreams are made of. Maybe any day and every day can be a good ol’ day. Don’t you think this song is the perfect personification of a sugary-sweet kind of product line? Maybe something that’s made of sugar and honey. You know, maybe something called Sugar Lips. You may be wondering to yourself, what in the world is this candy-inspired sensation called Sugar Lips. Sugar Lips is the brainchild of Baylor freshman Lauren Evans. 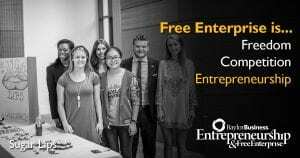 During the fall 2016 semester, Lauren was enrolled in Entrepreneurship 3301 (ENT 3301) in association with the Entrepreneurship Living-Learning Center. While taking ENT 3301, Lauren and her fellow classmates read The One Thing by Gary Keller, Founder of Keller-Williams Realty International. The students were then assigned to teams and each team was asked to build a business. Thus, we introduce you to Sugar Lips. Sugar Lips is a student-made lip cosmetic that exfoliates lips with cane sugar and moisturizes lips with honey and olive oil. The Sugar Lips mission is to create a high-quality and all-natural lip scrub at an affordable price that leaves customers with soft and supple lips. All it takes is a quick “lip scrub” Google search to realize that lip scrubs are the latest must-haves for beauty routines. But what makes this sugary phenomenon so special? According to Kaitleigh Booth the Chief Marketing Officer for Sugar Lips, regular lip exfoliating allows popular matte lipsticks to go on smoother and last longer. Kaitleigh also points out that there are a couple of things that set Sugar Lips apart from other popular lip scrubs. First, Sugar Lips is made up of all-natural and organic ingredients, hopping on the trendy, organic-beauty-products bandwagon. Fewer processed ingredients equates fewer irritations and adverse reactions. Second, Sugar Lips solves the unpleasant problem of dry and chapped lips. And third, Sugar Lips is right here on campus. Initially, the Sugar Lips team goal was to acquire an “A” in the class. According to Mary Abrahams, faculty advisor to the Entrepreneurship LLC, Sugar Lips was definitely a successful startup business. Mary explained that the students pooled together their own money to fund the initial investment of $104. In the end, they were able to pay back their individual investments as well as make a profit. It didn’t take long for this student-business team to realize that Sugar Lips may just be the start of something sweetly spectacular. Maybe, just maybe, they could expand Sugar Lips beyond the Baylor community. The team looked bigger…bigger as in the popular Saturday morning Waco Farmer’s Market. This group of like-minded, budding entrepreneurs has big dreams, but there are some hurdles. Sugar Lips is considered a personal care product, meaning it is a cosmetic and subject to FDA rules and regulations. Before Sugar Lips can proceed with any expansion goals, FDA approval is a required. Until then, the ladies of the Baylor community will enjoy being their best version of a sugar-sugar candy girl…with smooth lips. For more information about Free Enterprise at the Baugh Center, please visit our website at baylor.edu/business/freeenterprise/.